Saki, Episode of Tokis Sickliness. I've been eager to write this review for days since the semi finals in the national tournament started; however, I thought i'd wait to cast my final opinion until the end of the series. Alas, my opinion has not changed. I was quite puzzled at first to hear of a spin off series, or rather a "side story," to the Saki Manga/Anime. A proper Saki season 2 is fervently desired after all, but to due the speed of the manga release, I knew that would still need time. Perhaps it would feature one of the already developed schools in the previous series. Yet, to my dismay, a brand new incarnation of a mahjong team is introduced, Achiga Girls, who 3 of the 5 members are childhood friends of Haramura Nodoka yearning to reunite with her at the national tournament. The main weakness of the show starts right in its very foundation, the characters. I don't even remember all their names; with little reason to. There is minor or no development for most of them. I'm not talking about support characters, I will touch on that later, I'm specifically talking about the main cast of the series, the so called "heroins." As I glance at the poster to my right while writing this review, I almost feel sorry for them. Minus the Matsumi sisters, specifically Kuro Matsumi, the heroins receive very little love. And perhaps the only reason Kuro received some fleshing out is because she faces up against Teru, Saki's sister from the main series whose wrath is ominous. The two sisters arguably are the heart of the team, the only characters I grew to care about, but no where the level of any characters from the parent series. None of the girls also have any "special" or "unnatural" mahjong abilities beside the Mastumi sisters. Even then, it's never feared or glorified to the level of Haramura Nodokas brilliance, Sakis rinshans, Hisa's bad waits, or anything of the parent series. Which adds, in my opinion, a sense of normality to the characters, which can be taken in a two different lights depending on your perspective. For one, it adds a certain vulnerability to them. Knowing that unlike the parent series, most of the main characters, 3 of them particularly, depend on steady "normal" play. This hurts them in some aspect, too. For me, it added a sense of a benign feeling that I call "The Little Engine That Could." You want them too succeed. However, the national tournament is full of monsters. How can this team survive? And it's here in the national tournament where everything begins to fall apart. Senriyama, one of the four schools in the semi finals, became a pain in my side. A character name Toki is introduced and, in my honest opinion, because a "Mary Sue" of the series. This girls mahjong ability is by far the most far fetched in both series, the ability to see one turn ahead, later two, then three. That is, if she doesn't kill herself in the process, which I half heartily was hoping she'd fall out of her chair. Seriously. The girl is profoundly annoying. For some reason that I can't fathom, this one supporting character receives more character development than any of the main characters that it sickened me. Why was Toki being sensationalized so avidly, while the main character sat idle during the match and cried until the very last hand, where she finally received a glimmer of development, fleshing her out some along with the sister due to a flash back. I contemplated several scenarios whether or not this series was a catalyst or "vessel" for other purposes, since the Achiga girls were left feeling like supporting characters. For example, Saki's sister triumphant reveal, or perhaps the reason for Senriyama and Tokis ludicrous development was that they would be the ones advancing to the final round. But that can't be, can it? They aren't the main characters after all, supposedly anyway. Unlike the powerhouse parent series that boasted 25 episodes, this series stumbles through 12, with the remaining three to be animated sometime in the future. With the few cameo appearances of the characters from the parent series, though beautifully reanimated in a gorgeous art style-- on technicality this series is 5 stars--it just wasn't enough. If a fan of the saki series asked me if Episode of Side A was worth giving a try, I'd tell them yes, but not to set the bar high. The popularity and high ratings of Episode of Side A feels, in my opinion, blindly justified, while riding on the succes of the first series. Looking up at 62 5 stars baffles me. This series wasn't great, it wasn't good, but it wasn't utterly bad either. It was just simply disappointing. Honestly, I was kinda surprised they had a "side story" in conjunction with the actual main story because even in the manga, the main story wasn't even close to being done. However, I'm glad there is a background story that ties in nicely to the the mysterious Nodoka because it really lends to see how each character grew up. Also gives us a nice idea of what the other teams the Kiyosumi team don't play are like. In all, the main idea "Saki" had, still resumes in "Saki: Achiga-hen episode of Side-A", complete with the crazy ESP powers, fiery eyes, and fun mahjong jargon. If you liked "Saki", you'll like "Saki: Achiga-hen episode of Side-A". For all that have watch Saki before seeing this will be mad that it dont have much focus on the mahjong games, it focuses more on the characters. You will also feel that the story is rushed and that it could be much more episodes. That is true for the first 7 episodes, but i don't know how it will be in the later episodes. But despite this, i will say that it is a good show. I recommend it too all that have watch Saki and too those that haven't. But if you are going too watch this i would also recommed to watch Saki first because it is the main story. Saki Episodes of Side A is a sort of spin off of the original Saki series. It follows another high school that enters the tournament and is positioned in the opposite bracket of Kiyosumi. Three of the characters in this series have a link to Nodoka through being her childhood friends. The plot is essentially the same as the plot of the main series. The reason that this series scores better though is that none of the characters appear to be over displayed. This means that none of the characters have a personality that is either non-existent, or really hard to find. You do not get to see what happens. I am a person that doesn't like cliff hangers. It is supposed to allow the viewers creativity to run wild but for me it just seems like laziness. This show really got me interested in Mahjong. I've always thought of it as a solitaire game. I had no idea it could be a competitive game. The show it's self is sweet. It's about growing friendships as well as self growth. The Mahjong competitions can be crazy intense. Almost comical at times. Worth the watch. Excellent! Just the series to kick off your summer! If you want something light, something fun, yet with a relaxing plot, this is definitely the series for you. The characters each have their own unique personality and sweetness, you will fall in love with them instantly. It is one of those that have unforgettable friendship that makes you tear in your eyes, laugh with them and have sympathy for them when they are in trouble. If you loved Saki, you will definitely love this one. This is a great second season of the first series Saki you meet some of nodoka's friends from her past who are trying to meet her at the nationals for high school only. it has great characters and a good story of friendship you see many different personality's show. Kuro,Yu,Shizuno,Kana,Arata play against many different people like in Saki. 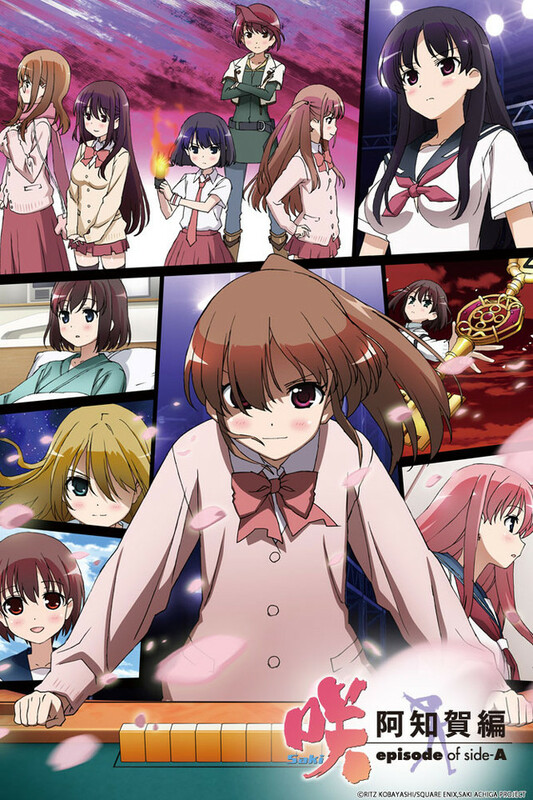 Like in the first season you see a good group of friends with different personalities that work together in order to reunite with there friend Nodoka and make it to the finals of the Mahjong inter-high school tournament. After they reach the semi-finals things are taking a real downturn. Flashbacks, flashbacks, flashbacks. Players who can not see only one turn ahead, but two! One player that is impossible to beat, no special reasons given, just that she always does it. Two full episodes on one single game, I'm on the third episode of that game now. This is getting to the point where you fast forward to skip the flashbacks and the superstition to get the five minutes of interesting stuff per episode. Why am I so negative? Because this series started out so great, and they manage to ..... it up co pletely.